All discussed with an irish brogue. Most of the rivers and lakes in Connemara are flies only, and many of the fisheries either require or strongly encourage catch-and-release angling. The sea trout are protected by law in Connemara, so must be released unharmed. But the salmon – and especially grilse – are often kept for the table because they are so delicious to eat. The brown trout that inhabit the rivers and lakes of Connemara behave like any other brown trout living in acidic, somewhat infertile water. Which means they're quick to grab a fly as soon as it comes into view! Most average around a pound, with many lakes and connecting rivers producing trout up to two pounds and more. And, you never know when a hold-over sea trout will rise to your fly – and they can run five pounds or more. They're all brightly colored and excellent fighters. The resurgence of the Atlantic salmon throughout the Ireland following the drift net ban in 2007 has reignited the country's fervor for salmon fishing. So much so that your guides will think you're a bit odd if you ask to go after trout. The salmon and/or grilse in Connemara run strong in one river or another from March through the end of the season on September 30, so there always an opportunity to try for a salmon. The trout and salmon seasons open in mid-February and run through the end of September. Trout fishing is good from the opener to the very end, although the insect hatches don't really get going until the end of March. Early season trout fishing is best when the water warms during the mid-day, and summer fishing is best during the lower light of dawn and dusk – although a nice overcast sky with a brisk wind will keep the trout active all day. Because a lot of the food available to trout in acidic water is blown in from the bank, keep a sharp eye out for the arrival of land-born insects like black gnats, crane flies (called "daddy long legs" or "daddies"), ants and beetles as spring turns to summer. The salmon runs start with spring salmon arriving usually in early April, grilse in late June, and fresh runs of both from July through the end of September whenever the rivers receive enough rain. But, it's critical that you contact the fisheries you plan to visit many months before your visit to book your rooms and beats during their best weeks – and before they fill up! Most of the fishing rights to the lakes and rivers in Ireland are privately owned, but permits are easily purchased from the lodges, hotels, fishing clubs and syndicates that manage each fishery. This might rankle some Americans who are used to widespread public access at home, but the privately managed fisheries in Ireland provide a high-quality experience without crowds or competition. Daily fees are reasonable, too, running from as little as $15 – $30 for a day of trout fishing to $150 or more for a beat on a top salmon river (although many lodges allow two rods to share a beat, which effectively cuts your cost by half when fishing with a friend). Many fisheries offer both full and half-day permits, making it economical for DIY fly anglers to sample plenty of water during a week's trip. Stout is an integral element of the Irish experience. Particularly when used to describe your fly rod. You probably won't have to buy anything new while preparing for a fly-fishing trip to Ireland, but the 50 lb. limit on checked baggage – and the new 22 lb. limit on carry-on bags – makes careful planning and selection of clothing and fishing gear a high priority. U.S. citizens and citizens of most European countries do not need a visa, but must have a valid passport with an expiration date of at least six months after the end of your visit. Everyone else should contact the Irish embassy or consulate in their home country for travel requirements. The weather in Connemara can change quickly from sunny and mild to wet, cold and windy – even in mid-summer. So bring lots of layers – or buy a thick Aran sweater in Clifden and look just like Liam Clancy! And, don't forget a really good quality waterproof/breathable rain jacket – or your favorite waxed cotton coat – plus rain pants if you plan to do any fishing from a boat. While fleece, down and other synthetics will keep you warm in the chilliest weather, most of the Irish people you'll encounter rely on wool. Wool is the only fiber that retains its insulating properties when wet – and wet is part of life in Ireland, especially in the west where it can rain frequently. 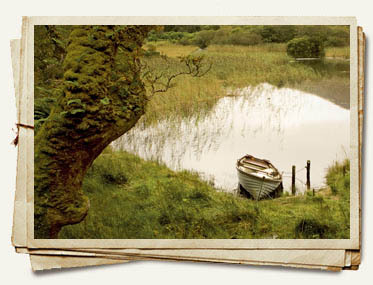 When fishing in Connemara, breathable chest or waist-high waders will help keep you warm and dry, but they aren't always necessary because much of the fishing is conducted from either the bank or on man-made "butts", which are stone piers built for Victorian gentlemen who didn't like to get their feet wet when fishing. A good pair of knee-high Wellington boots ("Wellies"), named for the duke who designed them, will also work for most of the fishing you'll encounter. You can bring your own or rent a pair from most of the lodges in the region. You can even buy an inexpensive pair from Stanley's tackle store in Clifden. Most of the tackle and equipment we use in the states works great on Irish rivers. The exception to this rule will be when you fish on one of the lakes, where your ghillie will provide the specialized tackle they prefer for traditional lough drift fishing and dapping – both of which require extra-long rods and special flies. Moreover, fly rods and reels can be rented from most fishing lodges as well as from many of the region's ghillies, so it's not absolutely necessary to bring your entire fishing arsenal. But, if you are particular about your rod and reel's performance (like we are), you will be happier if you bring along your own. We pack our 9' 4-piece rods in the bottom of our checked duffle, flying direct from Chicago. We've never had an issue with lost baggage. Some airlines will allow you to carry on your rods in their rod cases, which is a good idea if you are making multiple connections. Just be sure to check the airline's regulations for baggage and carry on prior to packing your travel gear. The ideal all-round trout rod for fishing Irish trout rivers is the old reliable 9' for #5 floating line, although your ghillie will hand you a longer one when drift fishing or dapping on the lakes. We will often bring a shorter 8-1/2' rod for a #4 line as a back-up, and for fishing smaller tributaries. Other than that, all of the tackle and equipment you use on trout streams back home will work just as well in Ireland. The water in Connemara is crystal clear, even during and after a hard rain, because the rainwater and runoff is filtered through thousands of acres of peat bogs before it enters the lakes and streams. This is fluorocarbon leader country, and we use 9- to 12-foot tapered leaders with a 5X fluorocarbon tippet for most of our trout fishing. For salmon fishing, a basic 9' – 10' single-handed rod rated for a #8 line is ideal, although a 7-weight would be equally effective. We bring 4-piece, 9-footers because they fit so securely in the bed of our roller duffles. A 12- to 13-foot two-handed spey rod rated for a #7 line takes the pain out of casting during very windy days. You don't need a heavy line because the salmon flies are quite small – often down to a size #12 or #14 – but the extra line speed and power generated when casting with two hands really tames the wind when it picks up. Some guides may urge you to bring 15' Spey rods rated for heavy lines, which we've found to be overkill. Floating lines are most common, but sink tips and full-sinking lines are helpful when fishing deeper pools and runs during high water. We normally fish a weight-forward floating line with a long belly to aid in mending, and we'll always bring several add-on sinking tips to loop to our line if the water is especially high – or deep. Because the rivers are so clear, even when in spate, long, 12-foot leaders with 4X fluorocarbon tippets are strongly advised. and a full selection of flies. The insects that hatch in Ireland, and especially Connemara, are very easy to identify. A majority of the mayfly hatches are various sizes and shades of baetis, or blue-winged olives – called "olives" in Ireland. Most rivers see an early hatch of Large Dark Olive ("LDO"), a dark-winged #14 olive that emerges during the mid-day in late March, April and early May. It's followed by a succession of increasingly smaller olives through the summer, which can be matched by light- and dark-hued blue-winged olives in sizes from #12 to #18, and occasionally #20. Mid-summer also brings evening hatches of small yellow mayflies that are very similar to PMD's (or sulphurs) in #14 - #18. Caddis flies, known as "sedges" in Ireland, begin hatching when the weather warms in early summer, and they can be best imitated with #12 - #14 elk hair caddis tied with tan, green, black and rusty-red bodies. The popular "murragh" inspired the development of the Goddard caddis (#14) – known as the G&H caddis in the U.K.
Terrestrials blow into the rivers and loughs all season long, but are most prolific during the warmer summer months. In the acidic rivers and lakes of Connemara, land-born insects blown into the water by the brisk winds off the north Atlantic are an important part of the trout's diet. So bring plenty of ants, beetles, and black gnats – plus realistic imitations of the adult crane fly (called "daddy long legs" or "daddy's" in Ireland). On the lakes, the first insect hatch of the season is the "duck fly" in late-March and April, which is a large #12 – #14 chironomid, or jumbo midge (called "buzzers in the U.K.) that got its name because it's a favorite food of wild ducks as well as trout. Duck flies are best imitated by a large midge emerger tied with a silver body and orange throat on a size #12 hook, which your fishing guide is sure to provide. The Duck fly is followed by the famous "mayfly" on Lough Corrib (but not on the acidic bog lakes and rivers farther to the west), which hatches from mid-April to mid-May – and looks like a #12 pale morning dun tied with pale yellow wings. Except for Lough Corrib, the rivers and lakes in Connemara are quite acidic and infertile, owing to the surrounding peat bogs, so the trout are not overly choosy when it comes to taking a fly. 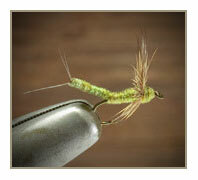 We often fish a small (#14) elk hair caddis or parachute Adams with plenty of success. And if the trout aren't looking up, we rarely go wrong fishing a small prince nymph. Sea trout are anadromous browns that are often called "white trout" when fresh from the sea and still bright silver in color. They are usually caught late in the evening or at night, and the best spots are well-known "trout pools" that are usually reserved in advance from the fishery that controls the fishing rights. Sea trout are also caught in the lakes near the top of river systems where they're fished from boats using traditional lough fishing methods, tackle and flies. In most cases your guide or boatman will supply all the necessary tackle and flies when fishing on the lakes, but river anglers must come better prepared. Sea trout flies are heavily dressed wet flies with colorful names like Red-Arsed Green Peter, Claret Bumble, Connemara Black, and Black & Silver Dabbler. Sizes range from #8 to #14, and most patterns are tied on relatively short-shanked, heavy-wire wet fly hooks. The few Irish rivers that host good runs of sea trout are those flowing into bays or estuaries where there are no salmon farms to infect the sea-bound smolts with gill lice. Unfortunately, because Connemara is literally surrounded by salmon farms, most of the once-famous sea trout runs are significantly diminished, and catching a sea trout is usually an unexpected bonus while fishing for brown trout or salmon. Most popular reduced or hairwing Atlantic salmon patterns will catch Irish salmon, and local favorites include the Blue Charm, Hairy Mary, Stoat's Tail, Silver Badger, Silver Doctor, Silver Rat, Silver Stoat and Silver Grey tied on double hooks in sizes from #6 through #12. The larger sizes are popular in the early season when the large spring salmon first enter the rivers, with smaller flies more effective when the grilse run in July. It would also be smart to tie up a dozen lightly dressed Irish shrimp patterns, like the original Curry's Red Shrimp – or the incredibly effective Ally's Shrimp from Scotland – on #8, #10 and #12 double and/or treble hooks. Like a common currency, shrimp patterns are good anywhere. We've also seen a lot of serious salmon anglers fishing Pot-Bellied Pigs (purple is a favorite), tied on double hooks in size #8. Oddly, very few salmon anglers in Ireland ever fish with bombers, buck bugs or Wulff dry flies, despite their effectiveness on remarkably similar rivers across the Atlantic in Newfoundland, Labrador and the north shore rivers of Quebec. Most of the guides we know assure us that dry flies won't work, but we plan to give them a little more time on the water during our next trip. It's our experience that selecting the "right" salmon fly is a combination of tradition, superstition, what-worked-yesterday, and plenty of dumb luck – so the best advice we can provide is to bring a varied assortment and change flies often. An endless supply of possibilities. And that’s even before you look for a pub. 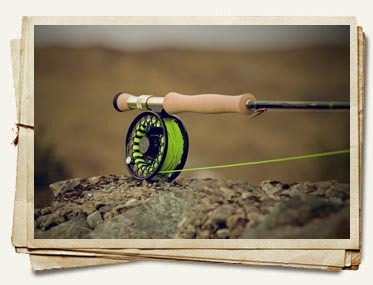 Experienced fly anglers will feel right at home when fishing Connemara's rivers, and most of the flies and equipment you use at home will catch trout and salmon in Ireland. Because the rivers run deep, most of the trout fishing in Connemara is done from the bank – and in some cases from stone "butts" or piers built just for that purpose. Fishing the smaller bog lakes and interconnecting rivers is always from the shore, and many of the larger loughs can be fished from shore as well. Traditional Irish lough fishing is always done from a boat, with an experienced guide or boatman to keep you drifting over the best holding spots. The fly-fishing methods are the same as any you use at home, although a 9-foot rod will make it easier to cast in the omnipresent wind. The wind is actually an advantage, especially in summer, because it obscures the trout's upward view through the extraordinarily clear water – and blows in an assortment of terrestrial insects that provide a lot of their food after the hatches of spring and early summer taper off. And we always welcome even the slightest breeze because it will keep Connemara's notorious biting midges at bay. Irish salmon respond well to a swung fly, which is the modern terminology for the traditional greased-line method. It's been deadly on salmon all over the north Atlantic for almost 100 years! The best fishing always follows a heavy rain when the river is "in spate", which brings in new fish and enlivens the rest. Because the rain filters through peat before entering the rivers, the water is clear almost all of the time, so fluorocarbon leaders and/or tippets provide a meaningful advantage. Flies are also quite small – often down to a size #12 in the summer and fall – and tied on double or treble hooks. A #7 or #8 weight-forward floating line is ideal – especially if it has a long belly to aid in mending longer casts. We don't bring sink tips, but use inexpensive sinking tips that loop to the end of our fly line instead. Long 9-1/2 and 10-foot rods offer a casting and line-handling advantage, but we usually bring 9-footers because they fit neatly in the bottom of our duffel bags. But if the sole purpose of our trip is to chase salmon for a week, we'll bring our longer rods in a carry-on travel case, along with a couple of 13-foot two-handed spey rods. The Irish employ two unique fly-fishing methods on their lakes which might appear a bit strange, but, both techniques are well worth trying, because they'll quickly dispel any notion you may hold that lake fishing is boring. Some of the best trout and salmon in Connemara (and the rest of Ireland and the northern British Isles) are caught from large rowboats by "dapping" or using the traditional lough fishing method. These styles of drift fishing take advantage of the windy conditions so common on Connemara's lakes. Traditional lough fishing calls for a 10-12 foot rod rated for a #5 or #6 line, a 20-foot leader of 10 lb. test fluorocarbon, and a brace of three flies placed about four or five feet apart on the leader. 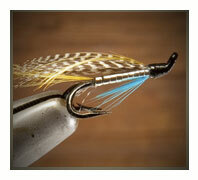 (Almost every ghillie who specializes in traditional lough fishing will provide you with this specialized tackle.) With the boat positioned sideways to the wind, anglers sitting in the bow and stern make short, 20-yard casts down wind and briskly retrieve the flies so the top fly bobs up and down on the surface of the water, the second fly (usually a high-floating caddis) skitters along the surface, and the third (a weighted nymph or emerger) returns below the surface. You can cover a lot of water as your ghillie maneuvers the boat to drift over the best holding areas, which are typically no deeper than "the length of an oar". Strikes can be quite explosive – and very exciting because they occur so close to the boat, especially when you consider that many loughs hold native trout that average 3 to 4 pounds – and salmon much bigger than that. Dapping is an equally effective and exciting method employed by many guides – especially during the mayfly hatch on Lough Corrib. Dapping requires a very long rod – between 14 and 18 feet – and 6 – 8 yards of dapping floss that catches in the wind and provides the action to the fly. The floss is knotted every two feet, with one end attached directly to the backing on the fly reel and the other knotted to the monofilament leader. Leaders vary in length from a few feet to many yards, depending on the velocity of the wind, with longer leaders used when the wind is stronger. A floating fly imitating either the prevalent mayfly or a crane fly (called daddy long legs – or "daddies") is tied to the leader and cast downwind from the boat. Then, by gently waving the long rod in a pronounced back-and-forth arc while the floss billows in the wind, the fly will dance across the water's surface – which can positively enrage any trout or salmon lurking below.